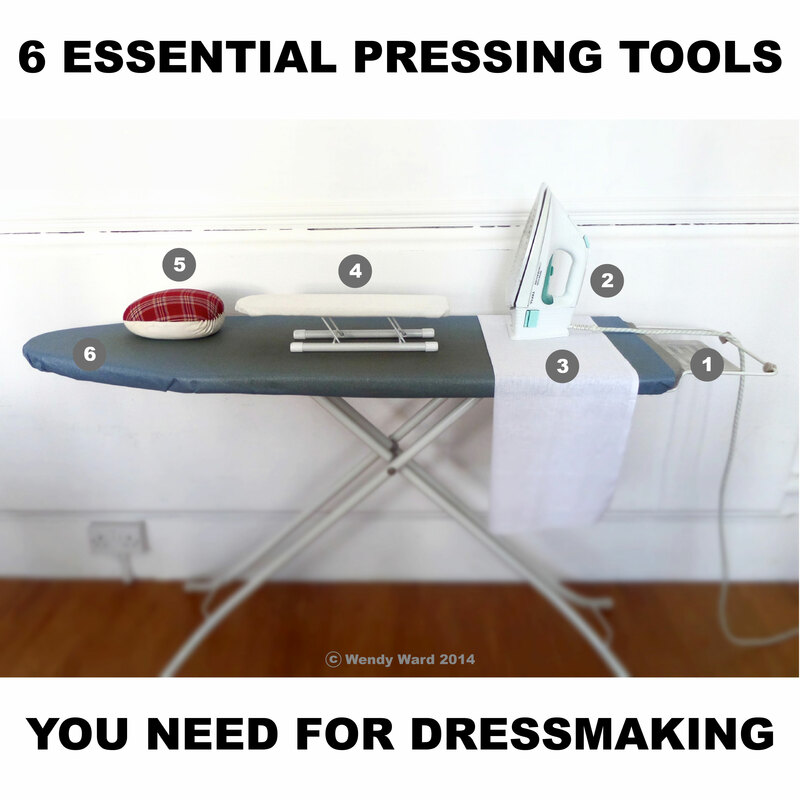 Which Pressing Tools Do I Really Need? 2 – IRON – your iron should not be too lightweight which might go against what you would instinctively look for (lightweight = easy, no aching arms! ), but to press well, you need some weight, so a lightweight iron actually means more effort is required from you! Irons are now available with a whole range of high tech materials on the sole plate which can glide over your fabric and also be non-stick (handy when ironing on fusible interfacing), make sure the sole plate also has plenty of steam holes and has a nice long tapered point at the end to make it easier to iron in and around those fiddly bits of your sewing. Also look for a variable steam setting, a long cable and a large water tank. The irons that come with a separate steam generator (that look like they’re sitting on a tank) can be useful but obviously take up more space and the cords tend to be a bit shorter. If you live in an area of the country with hard water, always use ironing water to avoid your iron scaling up and leaving dirty marks when it steams. My recommended brands: TeFal, Rowenta, Morphy Richards. 3 – PRESSING CLOTH – a simple piece of unbleached or white cotton muslin will be the cheapest and most useful addition to your pressing tool kit. It allows you to protect delicate fabrics whilst ironing and will also protect your iron. Place it between your fabric and the iron and always use one when ironing on fusible interfacing. Some people use a tea towel for this job, but it won’t work as well because you need a fairly open weave fabric like muslin which allows the heat to pass through it, tea towels are too densely woven and will simply block most of the heat. 4 – SLEEVE BOARD – might look like a luxury, but once you have one I guarantee you will use it a lot! They’re not just for sleeves, they’re handy for any awkward to get at bits of pressing such as inside leg seams, pocket openings, cuffs…..see what I mean?! They’re a bit harder to get hold of than ironing boards, but not if you shop online – you can even find them on the John Lewis website. Sleeve rolls are a good alternative – these are long sausage shaped objects filled with sawdust to make them more sturdy. I’ve even heard of people using rolling pins wrapped in a towel! 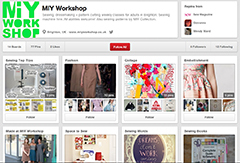 My recommended brands: Minky, Brabantia, Prym or look for a nice vintage wooden one. 5 – TAILOR’S HAM – so-called because of its ham-like shape, this is another tool that once you have, you’ll wonder how you ever lived without! Stuffed with sawdust to make it solid and compact, a tailor’s ham really is the best thing for pressing darts and any curved, awkward to get at areas of your garment while maintaining their shape. Choose one that is a reasonable size (get an idea of scale from my photo) and make sure one side is covered with a slightly hairy wool (usually checked) and the other in a smooth cotton for pressing different types of fabric. I don’t really have a preferred brand for these as there are so few making them, have a look at some of the shops listed at the end of this post, most of them stock tailor’s hams. 6 – IRONING BOARD COVER – a padded base on your ironing board covered with a reflective cover gives the best surface for pressing. A bit of padding supports your fabric and reflective covers have multiple benefits: they reflect the heat from the iron back into the fabric for a thorough press, won’t absorb spills and leaks of water from your iron and are easy to clean (things tend not to stick to them, unlike fabric covers). My recommended brands: Lakeland have a separate padded base, Brabantia for reflective covers. Next in this series on tools and equipment a question that keeps cropping up from my students: Should I buy a mannequin? This entry was posted in Sewing equipment & machinery, Sewing help and tagged do i need a pressing cloth, do i need a sleeve board, do i need a tailors ham, easy sewing patterns, indie sewing patterns, learn to sew brighton, miy collection, MIY Workshop, modern sewing patterns, pressing tools, pressing tools for dressmaking, sewing classes Brighton, Wendy Ward, what is a pressing cloth, what is a sleeve board, what is a tailors ham, what pressing tools do i need, which iron to buy, which ironing board to buy. Bookmark the permalink.